“The balance of nature is restored,” declares a goddess at the end of Ponyo, continuing the 2,500-year-old dramatic tradition of Deus ex Machina. Audiences should be forgiven if they needed a reminder that the balance of nature was in jeopardy. They probably thought they were watching a movie about a little boy looking for his mother and adopting a new sister. So yeah, that whole “balance of nature” thing... don’t want to forget about that. But in spite of this tacked-on plot thread (and one or two other annoyances), Ponyo is a treat for kids and fans of Miyazaki, and it has much more depth than you might give it credit for. Ponyo is the name of a “goldfish” that five-year-old Sosuke (Frankie Jonas in the English-language version — Ponyo was released in Japan a year ago) rescues from a tide pool. He climbs the steep path to his cliff-side house to show his mother, who is late for work at the senior center, as usual. But as a prelude told us, Ponyo is no mere goldfish. She is the offspring of a mystical man who moved undersea and a Neptune-like sea goddess. But in the eyes of a five-year-old boy, she is a goldfish. Ponyo’s father Fujimoto (Liam Neeson) is very protective and he doesn’t want her to grow up, especially if she’s going to live among those filthy humans, with their pollution and diesel and noise. He manages to recapture Ponyo from Sosuke, but she escapes again, and in the process unleashes some sort of genetic explosion “to rival the Cambrian” and usher in the new post-human era. Simultaneously, a storm is unleashed the likes of which Sosuke’s rocky fishing town has never seen. (Miyazaki’s storm might be frightening for your little ones.) The gigantic waves are represented as enormous fish, and the storm follows Sosuke and his mother with an intent that — though not malicious — is frightening in its heedlessness. Riding the storm waves that chase Sosuke and his mother is Ponyo, who is beginning to transform herself into a human girl. Sosuke and Ponyo, now a girl (Noah Lindsey Cyrus), are eventually reunited and the storm abates, but by then the world has been nearly swallowed. The sea, now calm, comes right up to Sosuke’s doorstep, the rest of the island having been flooded in the sea-level rise. Even scarier, Sosuke’s mother drove out in the storm last night to help the seniors, leaving the two little kids home alone. All that remains is for Sosuke and Ponyo to set out on their toy boat in search of Sosuke’s mother and the rest of the islanders. It would be easy to dismiss the movie as just kids stuff. The very young protagonists seem to peg the movie that way, and the cloying pop song sung by children over the end credits would turn away any cultured person over the age of 13. But Miyazaki refuses to be dismissed. Consider the primary lasting effect of the storm, which is sea-level rise. Nobody uses the phrase in this film, but this is what scientists tell us climate change will look like. Miyazaki has made many movies about ecological disasters including Princess Mononoke and Nausicaa of the Valley of the Wind. But in those films the ecological peril takes the shape of garbage monsters decaying forests. This time he gets more literal, without being too obvious about it. Yet he also remains positive — and here you could dismiss the positivity as candy for the kiddies and Deus ex Machina for the masses, or you could read it as a hopeful declaration about human resilience. Consider Sosuke’s family. Three generations are represented. The story demands that our five-year-old protagonist save the world, which seems like a heavy burden. But that is who will inherit the ecological damage wrought by the parents and old folks in the world, so that’s exactly where the burden belongs. Consider the story’s acknowledgement of the importance of science. Miyazaki uses words like Cambrian and Devonian without explaining them. Sosuke’s toy boat is candle-powered; and though there is magic in the movie, the power for the little boat has to do with thermodynamics and not wishing. Sosuke is interested in biology, tide pools, Morse code, and nautical navigation. The only television in the movie is used by the old ladies, not the kids, so Miyazaki gives a positive example for his young audience to follow. 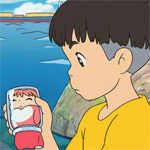 Miyazaki’s movies have often had charming characters, and Ponyo is no exception. Some of Miyazaki’s best work shows in his observations of children. He captures those sparkling moments of determination or habit or captivity that parents love: kids kicking off their shoes in certain way, lighting a match with great solemnity and care, or falling asleep at the end of a big meal at the end of a big day. Sosuke’s mom (Tina Fey) is written with great humanity, too. When she first encounters the mystical man looking for Ponyo, he appears on land pumping sea water before him and wearing a candy-striped suit. “That guy was a freak show,” she exclaims — then catches herself and reminds her son not to call people “freak shows.” She mistook his saltwater pump for weed killer, and scolded him for poisoning the planet, but then she drives like a maniac and supports her husband who’s a commercial fisherman. She’s a bundle of contradictions, and in Miyazaki’s hands she’s not a bad person for it, she’s just human. And the games and habits she shares with her son — “who thinks the faucet will work?” she asks during the storm, knowing that their well guarantees them drinking water — reveal a shared endurance of life’s uncertainties. Some of the characters don’t fare so well. Ponyo’s half-man father feels incomplete, as though he suffered some serious trimming from a longer version. Fujimoto collects unknown stuff in carefully labeled jars, but we don’t know how they combine to make a glowing vat of genetic diversity. It doesn’t really matter, but it feels like there is an explanation or two missing. Likewise the nature of the magical goddess and her relationship with Fujimoto feels like it has a deeper back story than we are told. The running time is a manageable 100 minutes, but I wonder if it was conceived as something bigger. The animation of landscapes and weather is amazing, as in all Miyazaki movies. The landscapes here are drawn more softly than in Howl’s Moving Castle. These more impressionistic, like a colored pencil sketch. The setting is almost Greek, with quaint fishing villas on the sides of cliffs, but greener and more lush. And the storm that changes everything is powerful and scary, and yet gorgeous and riveting at the same time. ... And then, every so often, some character will say something for the convenience of the plot, like “I feel the power to the depths of my DNA!” or “The balance of nature is restored!” And if you’re not fast enough bolting out of your seat, you may accidentally hear part of the godawful theme song sung by a Jonas and Cyrus. And you may forget that underneath the surface of Ponyo lurk great Devonian beasts who can’t be dismissed.